Since time immemorial (which is an ancient Masonic phrase steeped in symbolic meaning that translates as "ever since I first joined my lodge"), there has been an indispensable book sitting on our Tyler's desk next to the sign-in register. Its color changes every year as it gets updated, and it has appeared like clockwork. It is there for our lodge Secretary, Tyler, or other officers to dutifully look up and double check to see if a visitor's lodge is indeed listed inside as regular and recognized. 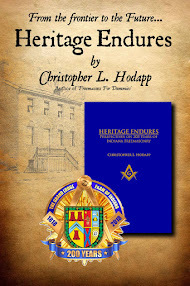 And our grand lodge committees on foreign fraternal recognition usually get copies as well. I am, of course, referring to the redoubtable List of Lodges Masonic, published annually by Pantagraph Printing out of Bloomington, Illinois. It has never been perfect, and it always has relied upon the due diligence of every regular jurisdiction's Grand Secretary to send in updated data to the printer. But it is there, it gets printed every single year, it's pretty accurate, and most important of all, it can be relied on. The importance of that particular aspect cannot be discounted, and 90% of the key to any success comes from just showing up. A list like Pantagraph's is only as good as the data printed in it and on its dependable publication. And they've been at it a very long time. Brethren WANT to travel, and they WANT to make sure they are visiting regular, recognized lodges. But few individual Masons bother to purchase these books for themselves. And for decades when brethren knew they were going to travel outside of their state or country, they would frequently call their Grand Secretary, who would consult this very book to either tell the brother his options over the phone, or just Xerox the pertinent pages and mail them out to the member to keep in his pocket and consult when he gets to his destination. About eight years ago, a Maryland Brother, Eric Madison, developed a smartphone app called Masonic Traveler that was an attempt to list all of the lodges in the US and link their addresses to Google maps to make finding and visiting lodges easier. But that app seems to have vanished into obscurity since then. That was a shame, because there was a great idea in there and assembling it was a lot of work to accomplish. Since then, there hasn't been an attempt to resurrect it. Until last year. Two weeks ago, Eric Diamond on the Xoriente podcast spoke with the guys developing the Amity smartphone app, and I took the opportunity to download it myself and speak with Jeremy Barnes, the main code developer behind it. If you haven't discovered it yet, Amity is slowly growing into a digital smartphone replacement for (or adjunct to) Pantagraph's List that helps brethren travel. And it is a lodge finder program that simply helps regular, recognized Freemasons connect with each other. The short explanation is that Amity is a growing directory of regular, recognized lodges around the world on your phone that helps you travel as a Mason. It is secure, private, and requires registration, with you linking your name to a specific, regular, recognized lodge in a jurisdiction. Once you do, you are able to scroll through the database and search for other lodges to determine their regularity and recognition status with yours, just like Pantagraph's List. Amity came about, like countless other great ideas, out of informal conversations during Masonic Week (at Shelley's of course), and is spearheaded by Michael Radigan of New York's Independent Royal Arch Lodge 2 and Jeremy Barnes out of Potomac Lodge 5 in Washington D.C. It is currently a volunteer process of coding and inputting the data as they are able to acquire it. 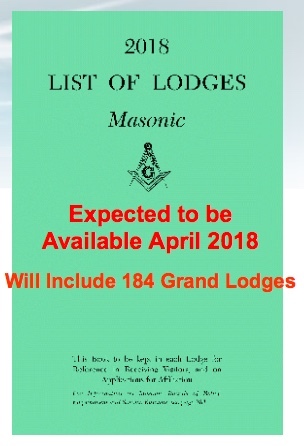 As of now, the program lists 35,000 lodges from 250 mainstream, Prince Hall, and international grand lodges—32 states and 17 countries so far—with more coming every week. Even "irregular" ones are included, so that amity and recognition questions can be easily answered (important since not all GLs recognize the same ones around the world). Lodges may be looked up by grand lodge, location, name, or number. Once you are verified as a Mason, you can see lodge addresses and a link to a Google map to find your way. It is NOT related to Pantagraph as a business entity, and there is zero coordination between the two. Amity is being developed independently by Michael and Jeremy and their small team of brethren at Copiri software because there simply was nothing else like it available. It is NOT a lodge membership database management system, meaning that if your grand jurisdiction utilizes GrandView or MORI, or has its own custom database system, that's fine and dandy. It doesn't replace those, or even augment them. An actual grand lodge doesn't HAVE to do anything with Amity at all—although it would be far better for everyone if grand lodges everywhere around the world do cooperate in updating the lodge lists and recognition information, along with verifying members. Unfortunately, getting lodge information has been like pulling teeth, with some jurisdictions eagerly participating, and others not wanting to share their basic lodge information at all. Cooperating permits lodge lists to be updated instantly, instead of an annual publishing lag time.The more grand secretaries keep it updated, the more useful the app will be for everyone. Anyone can download the fully functioning app for iPhone or Android for free. It doesn't dispense with the proper examination of visitors process in your lodge, but it does make looking up a lodge's status fast, simple, and instant. You don't need "permission" from your Grand Secretary to use it. It is free, and lodges and grand lodges are not charged anything for listings. Privacy and verification is Copiri's primary consideration, and Amity is NOT taking your data and sharing it: nothing is shared "online." It is all encrypted, and I'm warning you right now, try not to lose your password, because recovering and resetting it is a huge pain to reestablish—very deliberately. The developers take it seriously, knowing full well that Masons in some jurisdictions risk their jobs and reputations by simply being publicly associated with Freemasonry. And the current verification system addresses the question of whether a user really is a Mason in the first place. The team has bigger ideas for down the road, with more features coming. 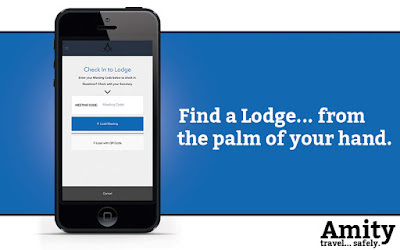 If it is fully utilized, lodge secretaries can use Amity as a digital sign-in book, as a global "Tyler's Book" system. Some grand lodges that use dues cards are placing barcodes on the back of them, and the system will ultimately permit such a card to be scanned for instant registration. Eventually, brethren sitting in lodge together will be able to query the system to find out how to contact brethren they met at a meeting during their visit, dispensing with those lost business cards we all somehow drop between our car seats. Also, lodge secretaries will be able to see—and read—the proper spelling and honorifics of a visitor. If you've seen my handwriting, you know what I'm talking about. For more information and to read about its features and updates, visit the Amity website HERE. Then download the app and try it. And encourage your Grand Secretary to cooperate with the developers. 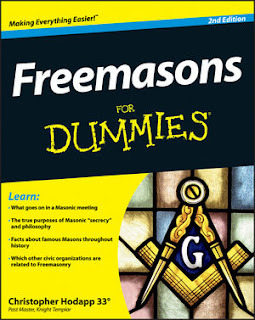 It will only help all Freemasons the world over. These references are helpful but need to be generous in their listings, since the recognition between jurisdictions is too complex. When I visited the Grand Lodge of Campeche, I asked why they weren't in amity with a number of other grand lodges. Their reply was that they didn't have the staff to handle it, some grand lodges insisted the younger grand lodge initiate the process of recognition which triggered a debate about actual date of origin, and that they didn't wish to exclude brethren because of technicalities who might visit --for example in a group from a local hotel where some would be from regular and some from irregular or at least unrecognized lodges. Another much discussed challenge is whether one can sit in a lodge of a grand lodge recognized by one's own grand lodge with brothers from grand lodges regarded as irregular, or with brothers who might be from recognized grand lodges but who belong to "irregular" collateral bodies. In Paris, a password is circulated among the various grand lodges which permits visitation, changed regularly, regardless of their supposed standing. in Mexico, in one often visited lodge the problems of Euclid on the altar are swapped for a bible when there is a foreign visitor, and the women members don't show themselves. In some countries the degrees are Christian and Jews are not always welcome. Then of course there are the lodges that exclude gays and colored brethren. None of this is on the lists. All of which is why it has been historically a "requirement" or at least an "expectation" that a Brother contact his own Grand Secretary BEFORE trying to visit a lodge meeting in another country. Grand Secretaries are theoretically supposed to be aware of these peculiarities, who then explain them to the member. The problem today is the unprecedented amount of international travel that goes on everywhere, and Masons are no different from anyone else in that respect. Cheap air travel, international jobs, independent networking, all combined with internet interconnectivity has all turned the historic methods of foreign masonic visitation on its head. This phone app is a first step toward trying to address that. It will be enormously labor intensive to accomplish (and I personally feel that the kindhearted brethren creating it are making a mistake by not charging a token fee for it, if only to prepare for what could be an onslought of work). But down the road, an application like this can be endlessly tweaked and amended for every jurisdiction, everywhere. So if an Indiana Mason wants to visit a Brazilian lodge (for example), the app can insert all of the various qualifiers and exceptions for each of the confusing grand lodges there that apply. The Pantagraph list has an extremely limited amount of this information, and I don't see that improving over time. If Amity becomes an international standard that COGMMNA and PHCOGM and international groups fully adopt, then these questions and issues can be addressed far more easily and quickly. It would also vastly improve the ability of the Commission on Information for Recognition to do its work. Frankly, the work the Amity guys are doing on their own needs to be adopted and placed under the umbrella of the MSA, at least on this side of the hemisphere. MSA could at least encourage cooperation and compliance with updating info far, far better than a handful of brethren trying to do this on their own. I suspect that very issue is a topic of conversation among their board members. And if it's not, it should be. This app should be adopted by all grand jurisdictions. It negates the need to purchase a book every year, just for it to sit in a drawer and thrown away at the end of the year. I downloaded the app and have already used it. I've pushed my GL to adopt it in place of the book. I've got my own app I created that is doing this very thing, plus more. The app is The Cable Tow, a new version is coming out very soon, but it is currently available on both iTunes and Google Play. Looks interesting, but its missing Wilder Lodge in Leominster, MA, so I can't register. Well, they fixed the entry for Wilder Lodge, very quickly and promptly. I'm now able to register. At the moment, it looks like full usage is only granted to Brothers whose Lodge Secretary verifies them through the app - I don't know how Secretaries get verified, but this looks like a major bottleneck to adoption. Re: Recognition: I'd really like to see GLs adopt some standardized human and machine-readable format for putting their lists of other recognized GLs online. At the moment, you have to search each site by hand, not knowing if such a list even exists, or is kept up to date. The staff at Amity is QUICK to resolve an issue.